Inkscape is a free, open source drawing tool (inkscape.org). I have created “extensions” to Inkscape that make it easier to create patterns with bobbin lace grounds. You can find instructions on how to install Inkscape and my extensions on my web site: Inkscape Extension for Bobbin Lace Grounds. 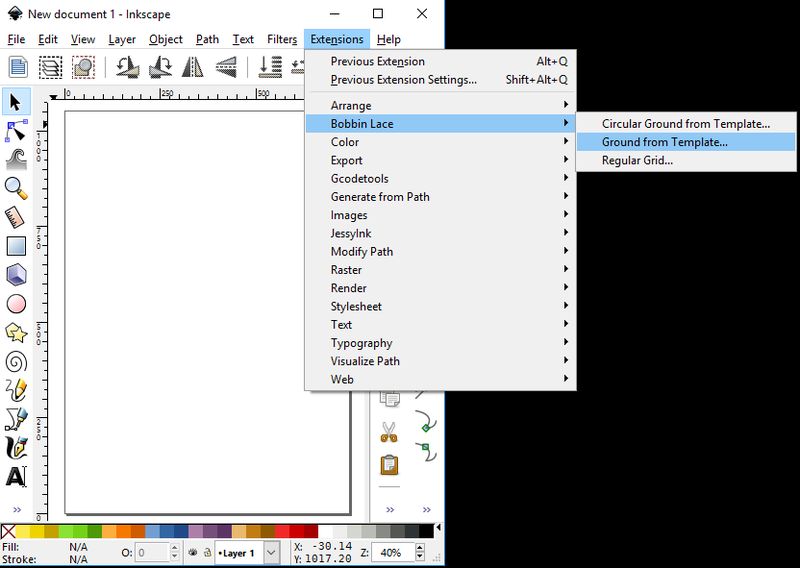 In this blog, I will talk about how to use my extensions and also describe some of the many other features of Inkscape that bobbin lace designers might find useful. When you start Inkscape, if the lace tool extensions are installed correctly you should see a menu called “Bobbin Lace” under the main “Extensions” menu. Under the “Bobbin Lace” menu you will see three options: “Circular Ground from Template…”, “Ground from Template…” and “Regular Grid…”. The Bobbin Lace “Regular Grid” tool will allow you to draw a grid of dots. In the pop up dialog you can specify the angle of the grid, the distance between the footside pins and the size of rectangle you want to fill with dots. After you have selected the desired values, click on the “Apply” button. The distance between footside pins is the vertical measurement between two dots on the grid. When designing lace, you can use the handy reference by Brenda Paternoster to determine the size of your grid based on the size of your thread. The Bobbin Lace “Ground from Template” tool will allow you to draw a lace ground pattern. Note: In the ground pattern, each line represents a pair of threads. In the pop up dialog you can specify the grid angle, distance between footside pins and the size of rectangle you want to fill with the ground pattern. You must also choose what type of ground to draw by giving the location and name of a template file. First, download the “templates.zip” file from Inkscape Extension for Bobbin Lace Grounds and copy the files to a folder where you like to keep your lace documents. The template files are in a zip file. You will need to extract them from the zip file (also known as unzipping the zip file) and place them in a folder on your computer (unzip instructions for Windows, unzip instructions for Mac – skip down the page to “Unzipping a File”). The template file you downloaded has two different kinds of files inside it: 1) PNG files (file names that end in .png) which show a picture of a small sample of the ground pattern and 2) TXT files (file names that end in .txt) which contain a description of the pattern that can be read by the tool. In the Ground from Template window, you need to tell the tool where to find the TXT file for the ground pattern you want to draw. For example, in the picture below, the full path to the file rose.txt is shown. Select the TXT file for the pattern (e.g. rose.txt) in the Windows File Explorer. Hold down the SHIFT key as you right click on the file and select “Copy as path” from the menu. Select the pattern (e.g. rose.txt) file in the Finder application. While holding down the OPTION key, click on the right mouse button to open the context menu for this file and select ‘Copy “rose.txt” as Pathname‘ as shown below. The Bobbin Lace “Circular Ground from Template” tool will allow you to draw a lace ground pattern wrapped around a circle. In the pop up dialog you can specify the inner radius of the circle, the number of copies of the pattern around the circle, number of rings and the grid angle. You must also choose what type of ground to draw by giving the location and name of a template file.